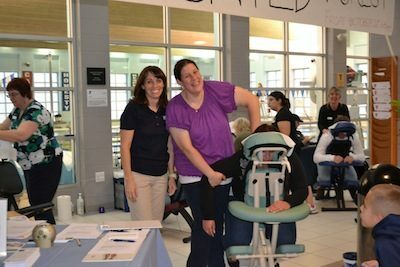 AMTA member Deb Levesque and former Mass Chapter Secretary and Newsletter editor Nichole Cross organized two nights of complimentary chair massage and education at the Wareham YMCA. Along with volunteers Kim Field, Ellen Duff, Christine Rose, Mary Ellen Barr, Lara Donovan and Shari Lecompe they treated nearly 100 YMCA members before and after workouts. The team provided research information about the benefits of massage and self care in a coordinated effort to educate clients. The therapists worked out a collaborative system of sharing their business cards with each other, so that each client received the information of the therapist located closest to them. Organizer Nichole Cross said, "The thing I love about the AMTA is that we come together for the love of our profession and promote each other without the presence of competition. It was a great event, the Y will definitely be in next year’s NMTAW plans."